Araura College recognised the many achievements of students over the last year at the Annual Prize-giving Ceremony at the Prince Edward Hall last Wednesday morning. The Principal, Ms Tracy Spiers, congratulated students and staff for a year of outstanding achievements. The morning was an opportunity to acknowledge and praise students’ achievements. Students received a range of awards and prizes including subject achievement prizes, leadership and virtues awards and prizes for practical achievements. Rayman Kiria was announced as the Dux 2015, and runner up dux was awarded to Pearl Mataiti and most promising future leader went to Lilian Temanu. Top overall for Level One was Ngametua Tuaiti, top year ten student was Koyal Kumar, top year nine student was Andrea George, top year eight student was Eden Ngatuakana and top year seven student was Itu Davey. Top sportsperson of the year went to Joshua Ioane, and top overall junior sportsperson went to Oroaere Kamoe, Len Tschan-Toi was awarded for being the most focused and motivated correspondence student and Tupou Samuel was awarded for excellence in Virtues. 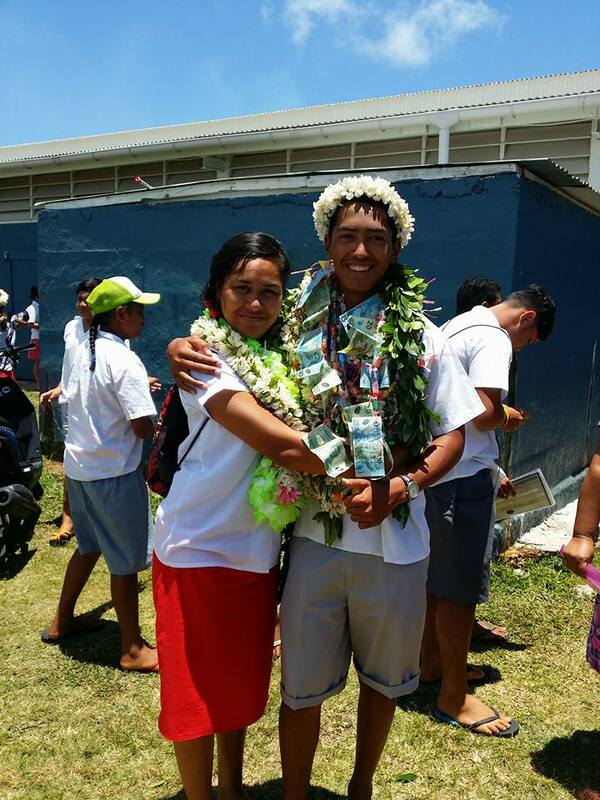 Top vocational boy was awarded to Kory MacShane and top vocational girl to Lilian Temanu. Kory MacShane also won top literacy and numeracy at level one. Overall top senior girl was awarded to Pearl Mataiti. This year we had a new trophy sponsored by The Aitutaki Conservation Trust – this trophy recognises the top environmental student and this year all founding members of the Araura College Enviro Squad received the award. The students that competed in the Australian Maths competition were also awarded many received credits but these students were awarded with distinction certificates – Petra Mataiti, Harrison Tossel, Ngametua Tuaiti, Mya Vaa-Taputoa and Kalani Vaa- Taputoa. Ruby Bragger was also awarded with the Prudence award. PTA chairperson – Tara Tschan-Toi, Maine Purotu – Miss Tania Bishop, the Head Boy – Teariki Mahitu, Head Girl – Lilian Temanu and Mya Vaa-Taputoa – year 7 student addressed the audience with words of wisdom and encouragement and there were many proud parents and family members to present ei’s on the well deserving recipients. Of the twenty four year twelve students, around six will be continuing their level three education at Araura College in 2016, with the remaining either attending Tereora College or joining the work force. The school also said farewell their Guidance Counsellor, Mr Eric Lander, Eric will be replaced by Mr Thomas Wynne in 2016. Congratulations to all for a wonderful year!